In 1823, the Russian artist Kiprensky completed the work on a portrait of a woman who later became recognized as one of the best in the genre of romanticism. He wrote in Paris to Catherine Avdulin, the spouse of a major general who was a big fan of secular balls and acquaintances with people of art. The picture creates the impression of poetry and some sadness. It recognizes its partial similarity with the Jockonda Leonardo: nature outside the window, hands folded in the same way. The colors of the canvas are surprisingly laconic: dramatic coal black combined with warm mustard. A vase on a windowsill with a fading stem of white hyacinth complements the grim elegiac atmosphere. The landscape outside the window is represented by a small stretch of verdant grove and an inhaling view of gray, purple thunderclouds. Against such a background, Catherine’s face seems even more fragile, defenseless. In her eyes, the soul of the heroine is read, a certain internal change. 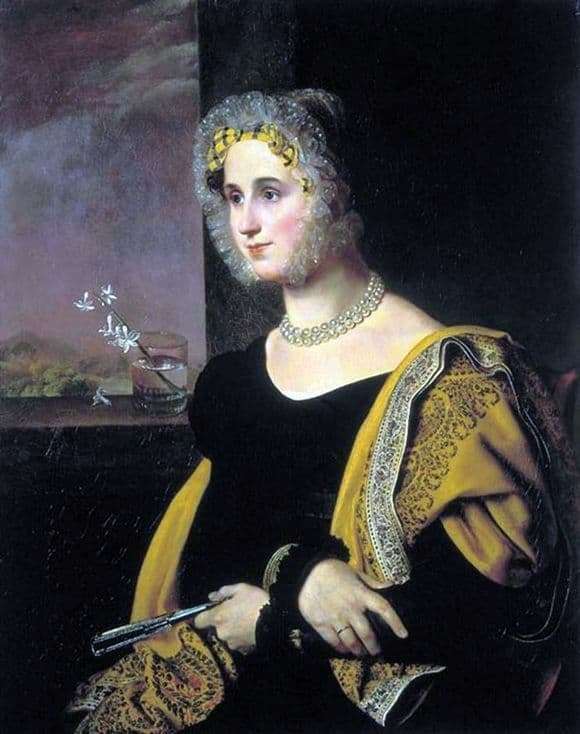 She herself is dressed in a black velvet dress and expensive shawl embroidered with small ornaments. On a strong neck glitter beads of large pearls. In the hand – folded fan. Feminine hands are written amazingly realistically. The face is framed by a yellow bow and a beautiful transparent openwork rim. The lady seems to the viewer aloof, closed, silent, not wanting to give out the riddles of his heart. But the artist, it seems, managed to read her soul. The contemporaries of the master recognized that the character of Catherine was unusually accurately conveyed, that feature of nature that distinguishes her from other people was captured. Nowadays, it is impossible to verify the similarity with the original, however, this fact does not interfere with the genius of the portrait. The skill of Kiprensky skillfully admires the portrait and skillfully fold the play of light and shadow, balance the composition with objects, make it restrained in colors and unnecessarily wordy in describing spiritual content.